Throughout 2018 we raised funds at our concerts and other events for our chosen charity of the year, Yorkshire Air Ambulance. We were please to be able to donate a total of £1517.78 to this very worthwhile cause. The choir is very happy to welcome to its new Musical Director, Kate Shipway. We look forward to the next stage in our musical journey under her leadership. On January 3rd 2019 Vocal Expressions held a farewell dinner at Meltham Golf Club to say goodbye to our much loved MD Robert Webb, and his very supportive wife, Jenny. Robert was with Vocal Expressions for 6 years and under his leadership the choir developed enormously.During that time he worked enthusiastically with the choir to improve its sound and our singing technique, and introduced us to lots of excellent new music that we have really enjoyed learning and performing. Robert expected high standards of the choir and worked us hard, but always made rehearsal fun. He will be really missed, but we are all looking forward to building on what he has taught us and to a fresh approach and new challenges. Vocal Expressions performed beautifully to bring their audience at Holy trinity Church in Holmfirth an afternoon of Christmas magic. Their guest, Simeon Wood provided even more enjoyable musical entertainment with his skilful flute (and walking stick!) playing, to further enhance a wonderful afternoon. Sadly this was the Choir’s final performance with their well-regarded MD , Robert Webb. Fittingly Robert’s first concert with Vocal Expressions was in the same venue 6 years ago when he sang a solo with the Choir as he did at this concert. What a fantastic evening - entertainment from the choir and Dr Reelgood, an excellent supper and lots and lots of dancing and merriment. 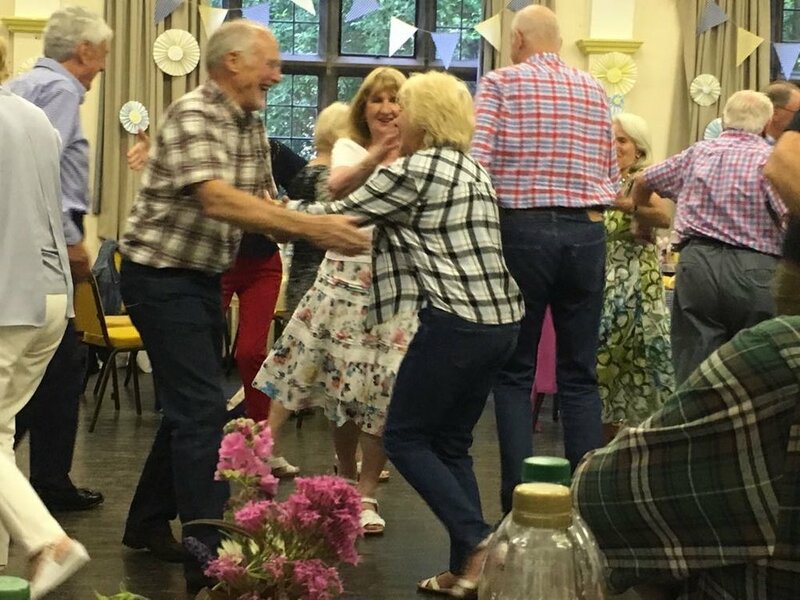 A really good time was had by all who attended the choir's ceilidh at Holmbridge Parish Hall, and £172.50 was raised for the Yorkshire Air Ambulance too. The choir held a Colours fashion show fund raiser on May 1st at Holmbridge Parish Hall and raised £217.60 through the raffle for Yorkshire Air Ambulance, which is its chosen charity for 2018. Numerous choirs from Yorkshire enter this festival and Vocal Expression's were thrilled to be placed second in two of the four classes they entered and to receive very good marks in the overall evening competition. It's fair to say this event was a challenge for the choir, but one it rose to admirably. Everyone had an enjoyable time and returned to the Holme Valley exhausted but extremely proud of their achievements. 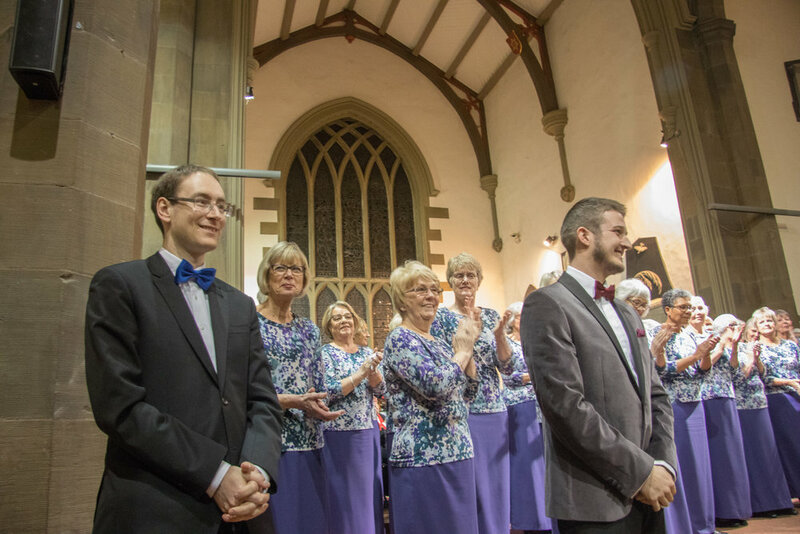 On the 3rd December Vocal Expressions and Slaithwaite Band put on a joint concert to celebrate the coming of Christmas at Holy Trinity Church in Huddersfield. All were agreed that both choir and band performed really well and it was a most enjoyable concert in this lovely venue. It was also the premier of a new piece of music 'Let's Sing,' written by choir member Kay Melia with the assistance of Lloyd Buck, our accompanist, to celebrate Vocal Expressions' 20th anniversary.